We all want to keep our children fit and healthy, and one of the best ways to do this is to make sure that they are getting plenty of good foods. This, however, is easier said than done when you have fussy eaters who would much rather be munching on sweets and chocolates. If you struggle to get your kids interested in healthy foods, don’t fret! We’ve compiled a great list of healthy snacks that your kids will love just as you do! This BBC Good Food recipe offers the perfect way for your children to get plenty of fruit into their diet, while keeping them interested with the bright colours. The best thing about this recipe is that it is so simple that you can make it with your kids to get them involved in the kitchen. Use all of their favourite fruits, such as strawberries, grapes and pineapple to create the rainbow colours, or maybe you could mix things up a bit and use different fruits for different themes such as Hogwarts houses or superheroes. If you want a really simple option that you don’t have to spend lots of time preparing, frozen watermelon is a great option. Simply slice watermelon into manageable chunks and pop lollypop sticks into the bottom. Place these slices onto a baking tray lined with baking paper and stick them in the freezer. These are the perfect treat for a warm sunny day that is a whole lot healthier than other ice lollies, but just as tempting. 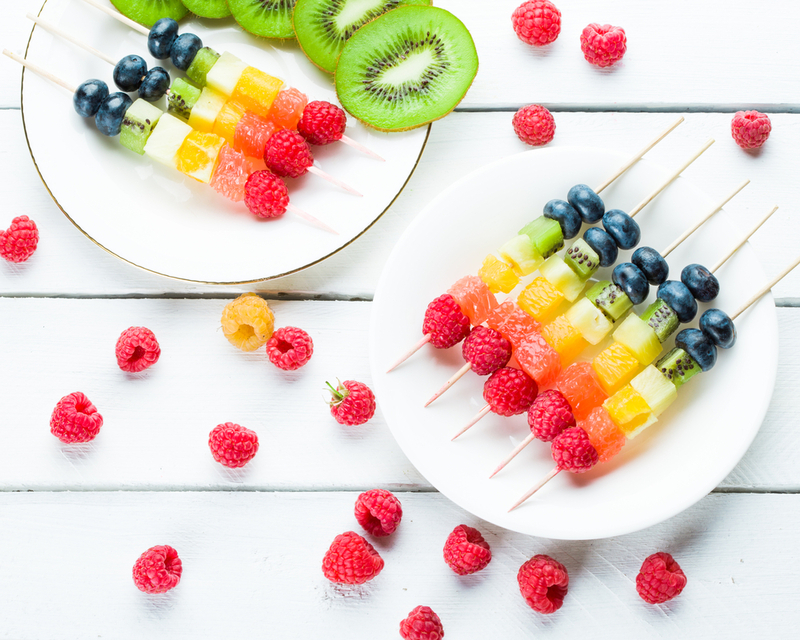 If you struggle to get your kids to eat fruit, you may need a few tricks up your sleeve to encourage them to try some. This recipe from Delish is particularly quick and easy to do and gives you a delicious treat that your kids are sure to love. If your kids aren’t a fan of peanut butter, you could always try out some alternatives such as cashew butter, granola butter or almond butter. 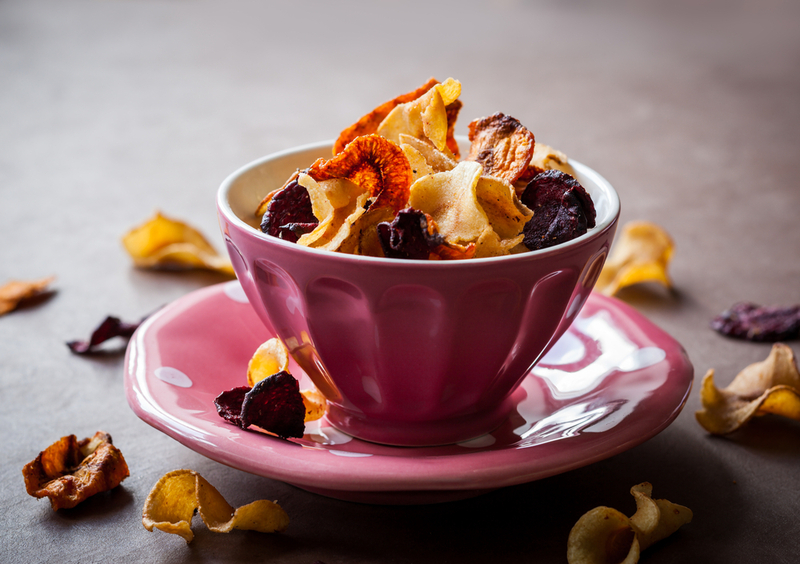 Crisps are often a particularly popular snack with children and adults alike, but finding a healthy alternative can be challenging. This recipe from Diabetes UK uses just vegetables and spray oil, far fewer ingredients than you would usually find in your average bag of crips. If you want to add a little more flavour, you could try sprinkling them with salt, pepper, paprika or any other herb or spice. This one snack can hold plenty of veggies but will be incredibly tempting for little ones. Using peppers, tomatoes, and cucumber to construct a boat, you can then fill it up with a tuna salad mix which is a great source of protein for growing children. You can even pack more veg into the tuna salad mix, helping you to make sure they get their five a day in. Follow the recipe at NY Metro Parents. There are a few different vegetables that can be notoriously difficult to convince children to try out, and cauliflower is one of them. However, with this recipe from Skinny Taste, your kids will absolutely love this often maligned vegetable! As the cauliflower is finely chopped, it can even be hard to tell that you are actually eating cauliflower at all, but this is a great way to introduce the kids to a vegetable they may otherwise turn their noses up. For the perfect sweet treat, you can make a fruit packed drink that serves as an excellent replacement for a milkshake. 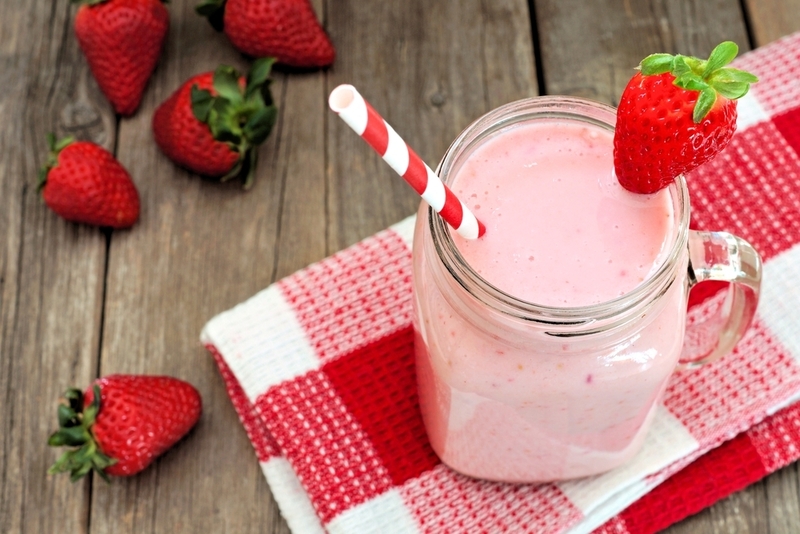 This recipe from One Sweet Appetite uses the sweetness of strawberries and honey to make the smoothie naturally sweet. You can make it to be thick like ice cream or add more milk to the recipe for a thinner milkshake. It’s hard to keep kids away from fizzy drinks, so if you’re looking for a healthier alternative, try this recipe from Parents for watermelon lemonade. Using just two ingredients, it couldn’t be simpler. Best of all, it’s a thirst-quenching drink that is sure to curb the fizzy drink cravings. There’s nothing quite like a chocolate milkshake to ease those sweet cravings. However, the majority of chocolate milkshakes are anything but healthy. This recipe from Eating Well puts a healthy twist on the classic, using alternatives that may reduce the fat but not the taste. Popcorn doesn’t have to be an unhealthy treat! In fact, you can create a sweet treat with popcorn that will be a huge hit with the kids. This recipe from My Recipes may seem like a lavish treat, but the recipe is low in fat, making this snack even more appealing. The chocolate and marshmallows gives the snack just enough sweetness, while the salt gives it a bit of an edge. Jelly is a timeless classic, and with this recipe from Kid Spot, you can ensure that your kids are getting plenty of fruit in their sweet snack. This recipe uses just three ingredients and is incredibly simple to make, so you could even get the kids involved in the process so they can sample their own creation. These cookies are a little more challenging to make than most of the other recipes, but they are so worth it! 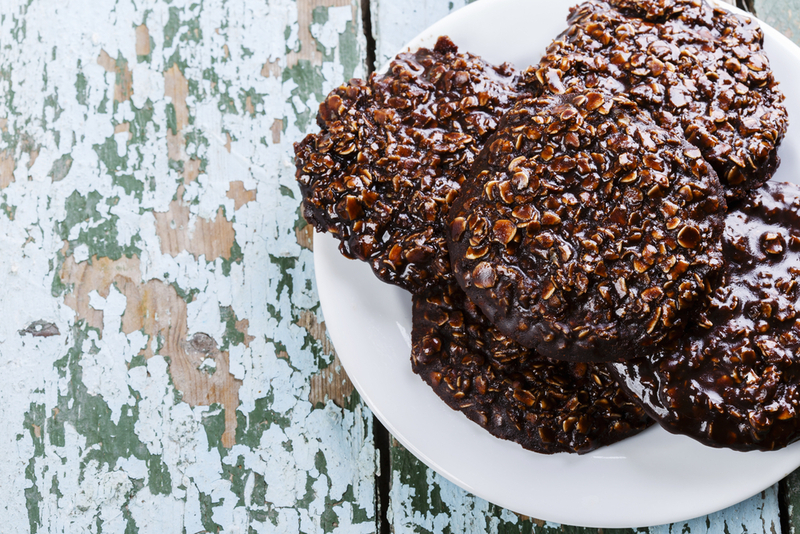 The recipe from Sugar Free Mom uses plenty of great, natural ingredients such as coconut butter, honey, and cocoa powder to create cookies that are as delicious as they are healthy. Keeping your kids healthy is probably one of your top priorities, but it can be easier said than done, especially when you have fussy eaters who would much rather be tucking into fast food than healthy food. Hopefully some of these recipes will help you to find some snacks that your kids will love just as much as you do, as they fill them up with fruit, vegetables, and other low-fat ingredients. Give them a go, and maybe you’ll even find some that you want to eat yourself!